Bridget (Hilary Swank) returns home at her brother’s (Michael Shannon) urging to deal with her ailing mother (Blythe Danner) and her father’s (Robert Forster) reluctance to let go of their life together. Playwright and theatre actress Elizabeth Chomko delivers a gut wrenching directorial debut with her award winning screenplay. The film is fortunate to have four top notch actors delivering unforgettable performances – Hilary Swank and Michael Shannon playing duelling siblings trying their utmost best to look after their parents, Robert Forster playing the father looking after his dementia stricken wife played by Blythe Danner. Bridget (Hilary Swank) returns home at her brother Nicki’s (Michael Shannon) urging to deal with her ailing mother, Ruth (Blythe Danner) and her father Burt’s (Robert Forster) reluctance to let go of their life together. The drama works as the script offers each of the family’s point of view on the problem. And each member is right and has sacrificed in her or his own way. There is no one correct solution. As the Burt character talks about love: “You find someone you can commit to, and then you work at it.” This line is also true even if you one finds ons soulmate or love at first sight. One has to work at it. The film contains many dramatic sets-ups with excellent dialogue and tearful moments. 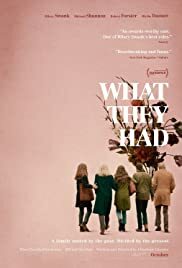 WHAT THEY HAD has a Gala Presentation at TIFF and might be a likely shoo-in for the People’s Choice Award.